There is no doubt that while travel is amazing, it does come with the occasional struggle. When I was leaving Lake Como with a friend last year, the taxi driver first overcharged us, and even though we paid him the full price, he still chased us all the way into the train station. We missed our train to Milan because he started shouting, "Polizia! Polizia!" and almost got us arrested. Luckily the police officers believed us when we told them we did indeed pay him the right amount and he was just trying to scam us. In that moment, I was not too fond of strangers. For every frustrating situation like that, there is usually at least one (if not more!) good situation to make up for it. During my solo weekend in Paris this summer, I experienced the kindness of strangers firsthand. I was by myself, in a foreign country, in a foreign city. Paris is an easy city to travel in, but these few moments where I was given a helping hand definitely confirmed my faith in humanity, and that a majority of the world is made up of good people. While waiting in line underground to get into The Louvre, I was chatting with an English couple while we waited. I told them that I was most excited to see Napoleon's Rooms, which I believed would be worth the extra few euros to get in. They said they were most excited for all the Italian paintings. Once inside, we rushed to the ticket machines and were lucky to get there when we did - a massive line began forming behind us for the ticket machines. On the screen, I was surprised I wasn't prompted to purchase the add-on for Napoleon's Rooms and asked the English couple if they knew anything about that. They offered to hold my machine (one of them stood at mine and the other stood at their's) while I quickly ran over to the information booth to ask. Turns out there was no extra fee for the rooms! I hurried back to the machine, thanked the couple for holding it for me, and was grateful I didn't have to stand in the continuously-growing line. 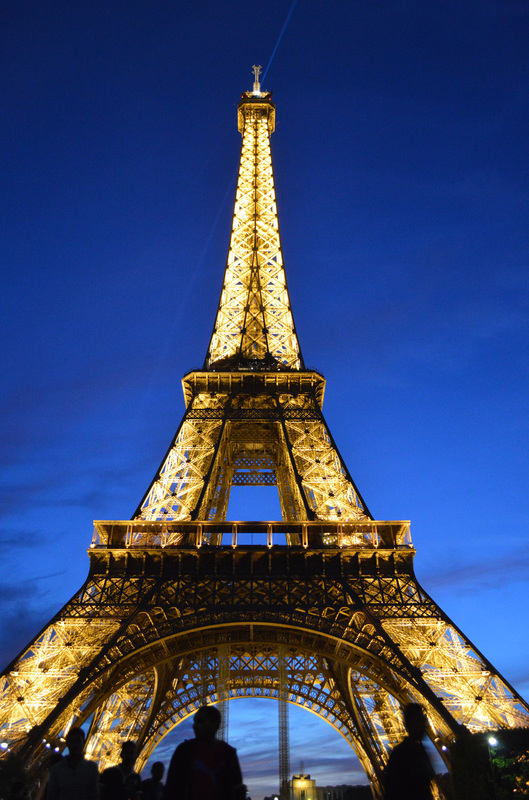 Since Paris was the first portion of my summer Europe trip, I was really jet lagged. On Sunday after hours of walking and exploring the city, I collapsed onto my hotel bed into a deep sleep. When I woke up from that long nap at 9pm, I happened to be really hungry. Upon the realization that it was late Sunday night and the cafes and grocery stores were closed, I thought I might have to skip dinner and wait till morning. But - alas - there was a Starbucks around the corner! I walked over to it and my hopes were tarnished as the sign on the door said it closed at 7pm on Sundays. As if on cue, a man walked up to me and told me there was a different Starbucks about 10 minutes away that was open till 10pm on Sundays. He said he was headed to that area and would show me the way. In the past I would've had my guard up and politely declined, but my instincts told me he was a normal person and not a serial killer. As we walked we chatted about where we were from and the differences in culture (he was from Vietnam and is living in Paris). We parted ways once we got to Starbucks, but I'll remember our conversation and the kindness of him showing me the way. I was also glad to find food! The next night I walked a long 45 minute walk from my hotel to the Eiffel Tower to see it light up at sunset. I found a nice spot in the grass and was marveling at the enormity and beauty of the tower. A man came and sat down near me, photographing the tower. He then started a conversation with me, saying he was a magazine photographer and it was his first assignment. I learned he was from Turkey, and told them I was in Istanbul recently. Our conversation wasn't really going anywhere after that, but he lingered a little. My gut instincts told me he was also a normal man and there was nothing to worry about. (Besides, there were hundreds of people around anyway). However, a group of American students sitting near me noticed this and invited me to sit with them. They weren't sure if I was uncomfortable or not, but in case it was a bad situation, wanted to help me out. I learned they went to school in Florida and were studying abroad for the summer. We chatted about college, Paris, traveling after graduation, etc. It was nice to make temporary friends for the evening and know that even though we had never met prior, they were kind enough to invite me to hang out with them to keep me out of a (potentially) bad situation. While these are all little moments of kindness, they are all moments where I realized that most people are good people. Even things like holding the door for someone, giving a warm smile, or pointing out directions to those who are lost goes a long way. Let's continue the kindness both while traveling and in everyday life!